Complete with Dogs...and Cats: Snow. Fall. 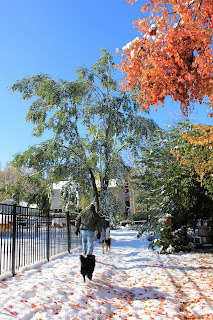 The snowstorm nor'easter that slammed the east coast on October 29 wreaked havoc in our neck of the woods. 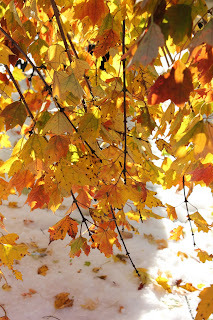 At the time, trees still had their leaves; many of which hadn't even begun to color, let alone drop. The leaves caught the heavy snow like cupped hands, and the overburdened branches bent and then broke under the weight, causing major power outages that more than a week later, are still being fixed. We were among the lucky few who did not lose power. We lost cable TV and internet--not much of a hardship unless you are a 17-year-old boy; sorry, Aaron. And for a short while, we had no water, as there was a main break on the street in front of our house. Many folks suffered through the cold with no heat and no hot water, so we counted ourselves spared. 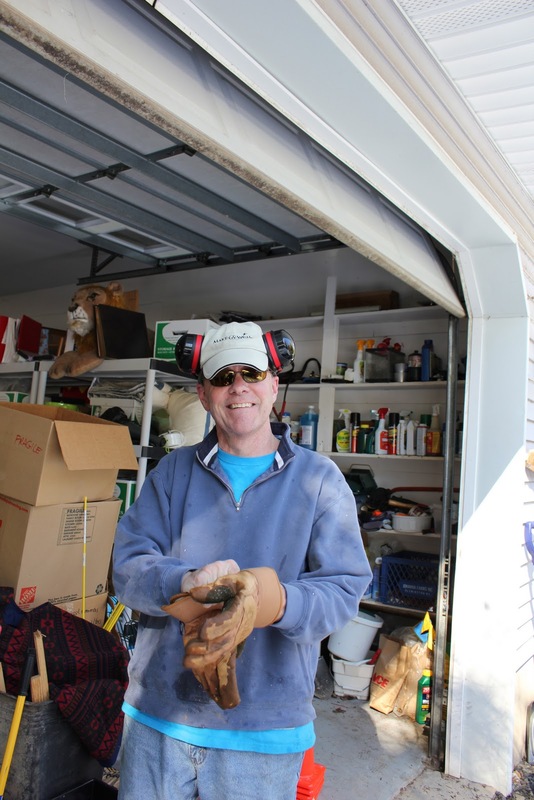 The day after the storm, we went out to assess the damage around our home. 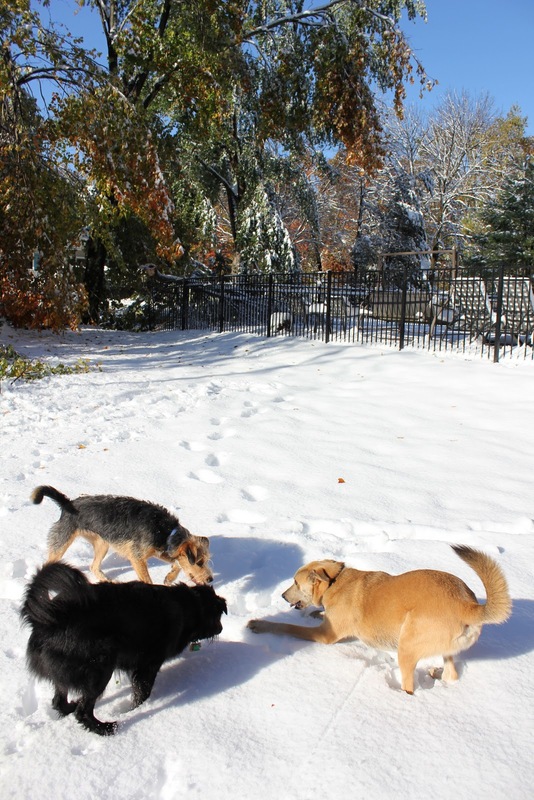 The dogs helped, of course, as they romped through 8 inches of the white stuff that had fallen. Branches large and small covered huge swaths of our yard, deck and patio. Other than Mother Nature's unsightly pruning to our trees, thought, the only real damage was to the fences, which are easily repairable. 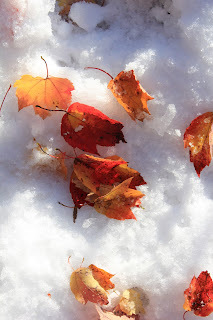 And as we walked around, we found an eerie beauty in the rare juxtaposition of warmly colored leaves with the spare sharp white of the snow. Branches still bowing under the weight of the now-melting snow, our trees looked spare and saddened. A couple of huge branches fell from the trees where we usually hang our hammock. Funny how the chaises are spared. This huge limb nearly crushed part of our pool fence. I am oddly drawn to its shape, as it brings to mind a dinosaur or dragon with a long neck and beaky snout. Our deck and patio were littered with branches. Yet there were no broken windows, and our furniture was untouched. Any drive down the mountain was a challenge for more than a week, as trees pulled on wires, and the power company scrambled to restore electricity. We've seen utilities trucks with license plates from all over the country since the storm. Yet there is beauty to be found. 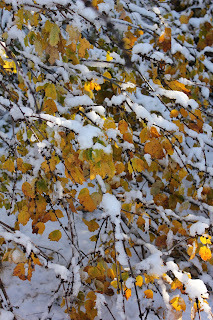 The sun creates a powerful glow to the leaves, contrasting against the white stuff. 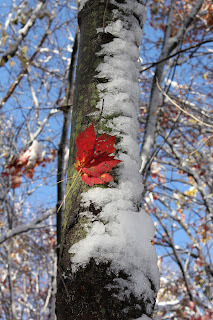 In our woods, the intersection of two seasons is even more apparent. As the snow melted, it fell in clumps from the trees. Here, a single leaf lit by the sun, hangs on through the bombardment. 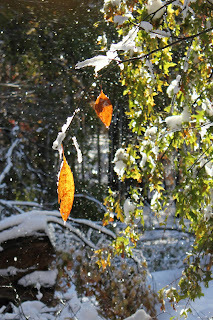 The wind blew snow against the trees; here, a leaf creates snowy stencil art. A single leaf, snagged on a branch, is offered up as a fleeting gift to the eyes. In the house, the animals were enjoying the unusual circumstances. Tucker is watching Athena who is watching a hungry bird looking for breakfast in one of our window feeders. Outside, Lilah simply loves the snow. Jasper shows Tucker the ropes in what is Tucker's first real snowfall. The dogs help Brian look for sticks. At least, that's what they thought he was doing. Brian and the dogs inspect the damage. 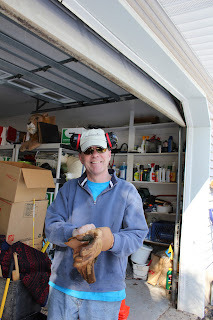 Work gloves at hand, Brian is ready to do some serious chainsawin'. 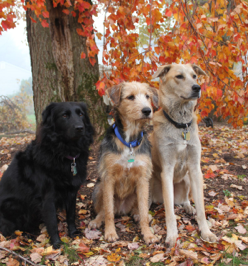 Jasper prowls like a striped tiger, among the debris, and Lilah and Tucker get ready for The Pouncing.